Recent release “Hit and Run: Book Three in the Eric Lewis Sports Series" from Page Publishing author Thomas Smythe is the heartwarming story of a three-sport athlete and high school sophomore, fresh off a heartbreaking loss in the basketball state finals, using the lessons learned from the loss to prepare himself for a promising baseball season. Thomas Smythe, a retired high school teacher, three-time state champion, and currently tied for the fifth most wins in Oregon high school history, has completed his new book “Hit and Run: Book Three in the Eric Lewis Sports Series”: a passionately written work that delves into the ideas of success, sports, and team bonding. Published by New York City-based Page Publishing, Thomas Smythe's motivational tale teaches readers that life lessons learned in sports far outweigh the heartbreak of losing a game. Eric Lewis had played on two excellent teams in his sophomore year and was looking forward to enjoying another season of success. Baseball was his third best sport, but their baseball program under Coach Mack had been dominant in the CVL for years. They had their two dominant pitchers returning and a host of veterans, so the season had great promise. Eric played center field and would probably be their third starting pitcher. He was a switch hitter and right handed had some power which hadn’t shown itself yet from the left side. Baseball had a different feel than both football and basketball. It was somehow more relaxing and seemed at times to be almost a slow-motion game. But when the pitcher throws the ball, the tension can ramp up in a hurry. They were the defending league champs and would have a bull’s-eye on their backs as they headed into the season. But this team had it all: power at the plate, excellent starting pitching, and the best coach in Iowa. 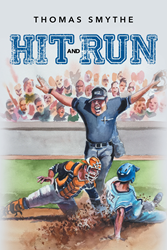 Readers who wish to experience this inspiring work can purchase "Hit and Run Book Three in the Eric Lewis Sports Series" at bookstores everywhere, or online at the Apple iTunes store, Amazon, Google Play or Barnes and Noble.